Samantha Liebman of NY1 did a nice segment on the Meadowlands Commission's Mother's Day Walk in Ridgefield. We saw these guys hanging out at Harrier Meadow on Friday. 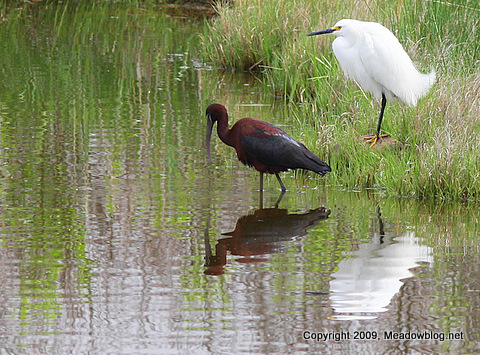 That's a Glossy Ibis on the left and a Snowy Egret on the right, for those keeping score at home. We have not seen the Glossy Ibis today, but if we do, we will send out an e-mail and have a walk for anyone who wants to see this beautiful bird. E-mail Jim Wright here if you want to have your name added to the e-mail alert list. Thanks to all who joined us on the first annual Mother's Day Walk in Ridgefield. The weather was great, and so was the walk. 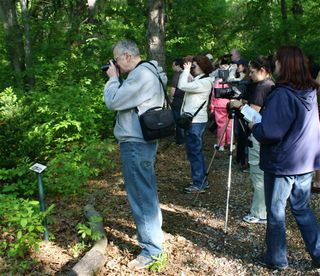 Roughly 20 people visited the thriving Ridgefield Nature Center, the Monk Parakeet Colony nearby, and the Skeetkill Creek Creek Marsh. 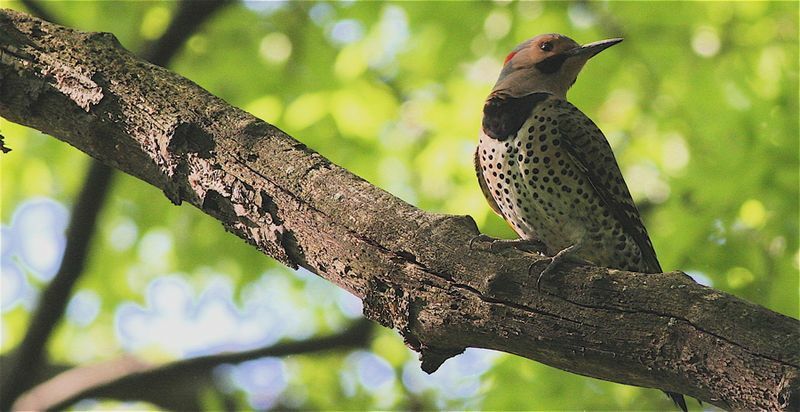 Highlights included Black-throated Blue Warbler, Black-and-White Warbler, several Northern Flickers (above), more than two-dozen nest-building Monk Parakeets, and a Short-billed Dowitcher. The Meadowlands Commission would like to thank Bruce and Karen Riede of the Ridgefield Environmental Commission and Don Torino and Bergen County Audubon for hosting the event with us. Click here for more posts on Ridgefield and and here for more posts on Monk Parakeets.